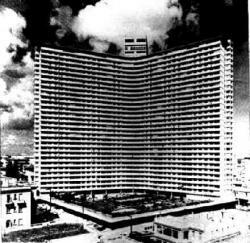 FOCSA is undoubtedly a pride of Cuban architecture. It is 121 meters high and at that time, it was the second highest concrete and steel building of the world. Therefore, it is considered one of the seven wonders of the Cuban civil engineering. In the year 1952 those plots of land were purchased by the powerful radio and television chain CMQ at a cost of 700.000 pesos aiming at building houses for artists and employees. Before the beginning of the work, different studies on the construction security were carried out. It was researched the impact that would have winds of 240 kilometers per hour over the structure and they proved that the structure would only move 10 centimeters in its top and this would not affect residents. From its foundations up to the tower, FOCSA building in Y shape has 39 floors and covers 10 000 square meters and the structure is made up by three main parts. In the first one we can find, the radio and television studios, stores, restaurants, a publicity agency and a theater. It has 373 luxury apartments of three or four rooms each positioned to receive day and night breeze, they are located in a 29- floor tower with 7 elevators. In the top we can find La Torre restaurant, an exceptional viewpoint where visitors can enjoy the international cuisine. At nights, the illuminated building decorates Vedados nights. Also, the original and functional design of this construction which is one of the most important works of Cuban architect Ernesto Gomez Sampero made it in collaboration with his compatriots Martin Dominguez and Bartolome Bestard. Original and bold for its time, this city within the city of Havana was renovated some years ago and it still challenges the new century and millennium.